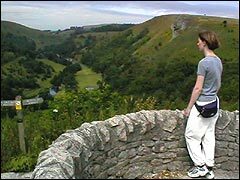 Venturing into the neighbouring county of Staffordshire, we screamed on some scary rides at Alton Towers; back in Derbyshire we walked to The Three Ships and Nelson's Monument on Birchen Edge, visited Bakewell and enjoyed a very scenic walk in Monsal Dale. 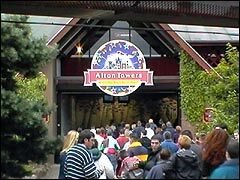 Alton Towers is a short drive into Staffordshire and on day 4 we headed there to brave all the scary rides - the first shock was that they charge for parking on top of the entrance! At Alton Towers we made straight for Oblivion - and got our fastpass tickets for our ride time. The ride plunges vertically into a steamy underground void at great speed. Eeek! 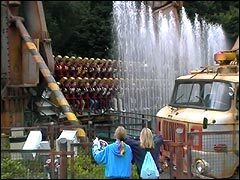 It was a bit on the cool side for many water rides, but the Ripsaw is a classic at Alton Towers, with jets of water squirting up to meet you strapped in the descending giant swing. 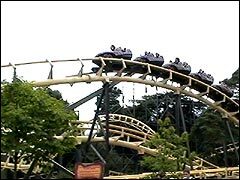 The Corkscrew has been at Alton Towers for many years and has two double inversion loops to ensure you see your lunch again! Even on the dull mid week day of our visit the queues were lengthy. Safely back at the Derbyshire holiday cottage, we ate in the evening when well away from those rides - every chance of keeping it down now! 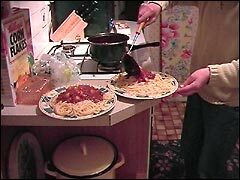 Belinda's serving up some yummy Spag Bol. 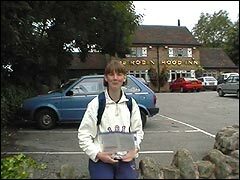 Next day, and outside the pub near Baslow for the start of our walk to The Three Ships and Nelson's Monument. Once again the weather wasn't too good, so... erm, a swift pint first? Not far into the walk and... it tipped it down! 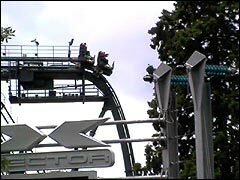 Still, we should be well used to a drenching after Alton Towers yesterday. Soon after this the mist came down, just what we didn't need! 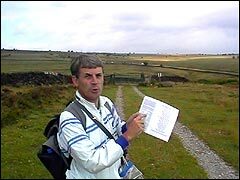 We both had trouble following the Peak District walk guide book. Later on we struggled through thick heather in totally the wrong direction before realising our mistake. Opps! 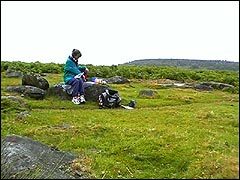 Finally, we reached The Three Ships and Nelson's Monument on Birchen Edge, and time for a breather! See our tourist resources page for relevant websites to our holiday visits. Of course, just as soon as we got back to the holiday cottage the sun came out, as it does! 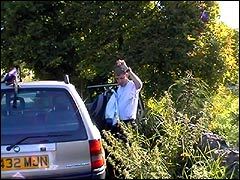 Here's Mike trying to negotiate the stinging nettles after parking at the cottage. Ouch! In the evening we ate out at a lovely pub not far from the Derbyshire cottage, both enjoying steak and chips washed down by some fine local ale. 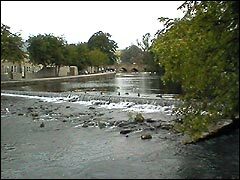 On our last day of the holiday we stopped off at Bakewell for a look round; this is the River Wye that snakes its way through this Derbyshire town. So our final walk in the Peak District was from Monsal Head along part of the Monsal Trail, and a chance to admire the scenic view along Monsal Dale at the start. 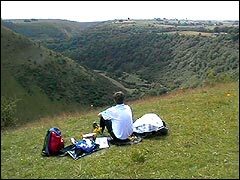 Our walk took us along part of the old Midland Railway, and what a simply wonderful spot for our picnic with another fantastic view of Monsal Dale! It's the River Wye again, this time near the old ruins of Litton Mill and a bit of industrial heritage. We walked alongside it for a while with some more scenic views. 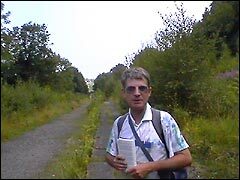 Back on the Monsal Trail on the home leg, we came across this disused station at Cressbrook. 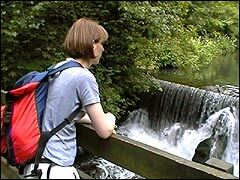 The Monsal Trail opened in the Peak District in 1980. Would you believe it, dodgy weather for the whole week, then warm and sunny on the day of leaving! If you look carefully Belinda's teaching Mike's teddy to fly! Despite the sometimes iffy weather, we certainly enjoyed our week in Derbyshire and got in three days of walking in the beautiful countryside of the Peak District National Park. 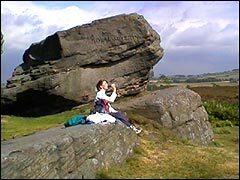 If you're planning a visit to Derbyshire you'll no doubt find our Peak District and other UK tourist related website resources that we've researched and reviewed handy. Another River Wye we've walked is the one in the scenic Wye Valley, also check out our Lake District and Isle of Wight walks.